Flawless vector work as usual, and an extremely colourful, yummy pop artness to this... can't miss this! Proposed by flyindreams and highlighted by kuroimisa. That thing in her basket could possibly be a flute (Zelda, anyone?). As for the wallpaper, the background and the twisted rainbow fit well with the light scenery. Good job! A flute in a picnic basket?! Well, I guess that's not entirely impossible. Neat vector and I love the background. Especially the musical notes. PS - added Nodame Cantabile category! Yay for me! damn stop making these good walls woman! I love this. It's cute, it's fresh and colourful, and it's pop. Great vectoring and the colors look good! Excellent job! SO ANTIQUE POP, I LOVE IT. Very cute, the rainbow really attracted me in to see the wall. Great job on vector and everything, can't say much that everyone has already. Love it! Anyways, great wall, faved this earlier on, but finally managed a comment. Yay! ahha! 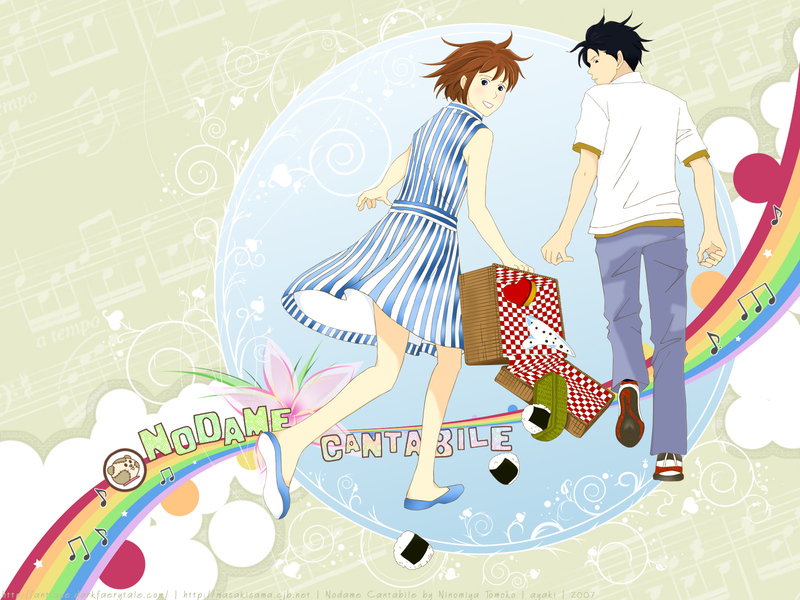 a nodame cantabile wallie! great~ one for the fav. Im going to go with eunashang and say that the thing in her basket looks like an ocarina ^-^ I actually wouldnt be suprised if it is one, because it seems the anime is about music? OMG what a fine work! It's very pretty! The colors are smooth and pleasant and the scene is very sweet! My favorite things are the flowers and cute details in white all along the back! This is way rad! I <3 <3 <3 <3 this, this is sooo my new desktop!